DD5LP/P – February 20th. 2017 – DL/AM-001 Peißenberg. The purpose of this activation was to test out the extension I had made to my linked dipole to cover the Sixty Metre Band (5.3MHz) that Germany gained in late december as a result of the World Radio Conference in 2015 (WRC15). This band is only 1KHz wide (5.3515MHz – 5.3665MHz. At the moment some countries have this new band while others (such as the UK) have other odd blocks of frequencies or channels. In the hope of a contact into the UK and to simplify things (and make sure I don’t operate out of band) I chose a few “channels” within the band and programmed these into my FT-817. 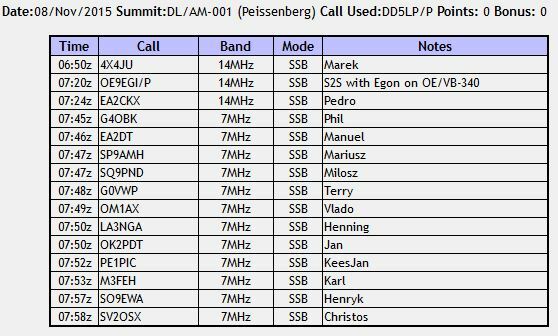 With everything ready antenna, rig and food, I decided it was tie to do an activation and while this was an experiment, I decided on DL/AM-001 Peissenberg, being a summit I know and only 45 minutes drive away from home. The weather forecast for Monday the 20th. was good, so I decided with an early start I should be on the summit at about the right time for propagation on 5MHz into the UK and with a little luck I might catch the tail end of the Long Path window down into Australia and New Zealand. Peißenberg, or Hohe Peißsenberg to give it, its full name, sits above the village of Höhen Peißsenberg about half way between Weilheim and Schongau in upper Bavaria. I had arrived and set up all of my gear by 0830 UTC. The drizzle had stopped but it was still quite cold with snow still in places on the ground (not what the forecast has said). In any case after manoeuvering the 10 metre mast around a little I managed to tie off both ends of the linked Inverted-V dipole to some handy points. Previously I would use the lower 6 metre mast but with the extra length, I need to get the centre up higher so that I could get the two ends of the dipole out in the restricted space that I had. I had had problems with the 10m mast collapsing into itself without warning on other occasions, so I was a little concerned that this might happen again, but I had to try. It was cold and the winds were getting stronger, so I needed to get a move on. I decided to start on 20 metres and had luck, my first contact was John ZL1BYZ in New Zealand. I was hoping for some more contacts from down under but as it turned out John was the only one. after another couple of CQs, with no successful responses I decided it was time to try out 60 metres. To do this I had to lower the mast and connect together again the 20m links so that the complete length of the wires were now in place as a 60 metre dipole. I switch to memory mode and quickly went through the channels I had programmed. Only hearing a couple of locals chatting on one frequency I went to one of my “international” frequencies of 5363.5 checked that no one was using the frequency by putting out a call asking if the frequency was in use – twice – no reply, so I spotted myself and called CQ. My first ever portable 60m contact was with Ingolf DG4FCN. Although he was about 5-4 the contact was difficult as there was QRM from another station just off my frequency. Later this station came and complained that he couldn’t hear his mate as I was “off-frequency” (i.e. not on a round number of KHz I guess and my little 5w from the FT-817 was flattening them). This will I’m sure remain a problem on this very narrow band as it appears some “channels” have been adopted for local natters in Germany. In my case, I realised that I could not simply tune the band while in memory mode and so I will need to look at somehow actually defining the 60m band in the FT-817. I moved to my other “International” frequency of 5.362MHz and put out another spot and call, this time I was called by Boyan S57AC and in this case band conditions did not make the contact very easy with his signal dropping into the noise, but we managed the contact and after getting no more calls I decided my experiment on this band was completed for the day but I’d try to grab a few more contacts on 20m before packing up. after seven more contacts on 20m, it also dried up and the winds by this time were whipping the antenna mast around somewhat, so I decided to pack up and head home. While pacing up the equipment and talking to a local walker explaining what I was doing, the mast self lowered (i.e. dropped into itself). This DX-Wire 10m mini-mast is not anywhere near the quality of the far cheaper Lambda Halbe 6 metre masts. I was lucky this time that the mast stayed up as long as it did. I may need to find a different location the next time I want to run 60m from Peissenberg, so that I can use the 6 metre mast instead. SOTABeams bandhopper linked dipole modified for 60 metres. Modified QAMP amplifier (20W on 20m). I am going to have to rethink operating frequencies on 60 metres to avoid QRM to and from other stations, while still being on a frequency that non WRC15 allocated countries can come onto. The 60 metre modifications to the SOTABeams Band Hopper have worked VERY well and it seems just 5W from a good location puts out a strong signal on 60 metres. DD5LP – November 8th. 2015 – DL/AM-001 Peißenberg. Andrew VK1NAM/P posted on the SOTA reflector that he wanted some S2S contacts into Europe, including one into DL, so as I was happy that the small kit was working having used it a few days before on Zweisselberg, I offered to put the full kit together and head up to Peißenberg. I had already activated this summit earlier in the year so I wouldn’t get it’s 1 point added to my activators total however it is an easy access summit, where I know how I will install my gear. It’s also only about 40 mi nutes drive away from my home. The last time I had used the “full pack” with my home built Ramsey QAMP, it had given me problems so before relying on it again, I decided to test it out and what do you think I found? It failed to work again. At least this time it was only two wires that had broken their solder joints from the switch I use to select the appropraite Low Pass Filter on the amplifiers output. The transistors seemed to be OK. After resoldering the wires to the switch, the second test showed the amplifier working fine on both 20 and 40 metres. So after checking all I need was packed and removing the items only used in the “small pack”, my camera bag and small rucksack were ready for a very early departure on Sunday morning. Top row left to right: Tripod with SO239 mount, spare 2500 maH battery below it, FT-817 and Nikon camera sitting on top of painters sheet (thick plastic). Checking on Google Maps I found that I would probably be able to cut about 15 minutes off my trip if I took some country roads to avoid going through Weilheim. This I did and the route was very clearly marked. I was nice to drive the small open roads across country and they actually let to the back of the mountain compared to my usual approach. In fact Google suggested I take some even smaller roads and approach the site from the rear, however I decided to follow the country road around to where it met the B472 and then access the mountain using Berg Strasse as I usually do from Höhen Peißenberg village. Perhaps I’ll try the really small roads next time. I had arrived and set up all of my gear by 0640 UTC. The sun had risen and the views were amazing. The trip would have been worth it just for the views but I was there to try and get a contact with Andrew VK1NAM/P on 20m and soon after my arrival he spotted that he was calling CQ on 20m. When I tuned to the frequency I could hear nothing, but then after a while two weak Russian stations came up on frequency. I don’t know if Andrew could also hear them, but he changed frequency and spotted again. I listened again – still nothing. Then I heard Marek 4X4JU try a call to Andrew with no response (Marek was looking for the WWFF points rather than SOTA). Over the next hour between putting out my own CQ calls I kept listening for Andrew without success. I believe Marek heard something from Andrew at one point but the propagation was certainly not with us today. Added to the bad long path propagation, lots of stations came on both 20m and 40m around 0730 UTC taking part in some contest, so it became very difficult to find a free frequency to call on without having heavy QRM from adjacent frequencies or in some cases have a contest station simply grab your frequency without checking if it was in use or not. In any case, I managed 15 contacts during the activation and got to test out the “full pack” set-up again, with the QAMP behaving itself this time. SOTABeams bandhopper linked dipole on a 6 m squidpole. QAMP 40/20m amplifier (25W 40m, 15W 20m). The propagation following the recent solar CME “glancing blow” are not yet back to normal but the late Autumn sunny weather made the activation a pleasure, even if an S2S contact with Andrew VK1NAM/P was not achieved. The QAMP is working again and is probably due to be built into a better case (lets hope it still works afterwards! ).